Getting a stairlift can be necessary if your home has stairs and you have somebody in the household with mobility problems. It obviously gives that person the freedom to use the whole of the house without any pain or difficulty, but does installing a stairlift present any problems or safety issues for the other people living in or visiting the house? One of the most common questions families ask when it comes to stairlift advice is what kind of impact the new lift will have on their normal home life, as well as whether any extra safety precautions need to be taken (especially if the household includes children or pets). Here, we take a look at what life is like with a new stairlift. 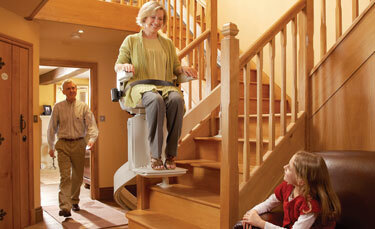 Will A Stairlift Be a Problem for Other People Using the Stairs? Stairlifts are very carefully designed to be safe and comfortable both for those who use them, and those who live in houses that feature them. Most don’t take up a lot of space when they are not in use, and so don’t present an obstacle for people walking up or down the stairs on a normal staircase. If the stairlift has to go around corners, it may make for a bit of a squeeze in certain positions if someone is trying to walk up or down, but this isn’t a major problem as it only really occurs when the lift is in use and part of the way up the stairs. In general, families tend to report that they get used to the presence of a stairlift in their home pretty quickly, and don’t really tend to see it as an issue. However, if you are concerned about what it will look and feel like to move around a stairlift before you have a given style of lift installed, you can get a good idea of this by visiting somewhere where you can see this, like a store that sells and fits the lifts, or even the home of someone you know who has already got one. 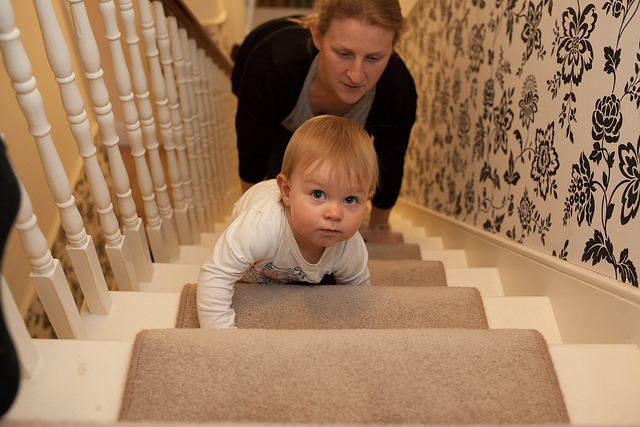 Young children may at first see a stairlift as something to be curious about. They will probably want to look at the machinery, and may well want to have a go at riding the lift up and down the stairs. While you will probably want to remind them that it is not a toy, it is often best to let kids become familiar with the stairlift when it is first fitted – most children will soon get used to it being there and stop paying it any attention after a while. Stairlifts are designed to be as safe as possible, and have features to prevent kids hurting themselves on them, such as finger guards. They are also designed in a way that prevents them from trapping a toddler or child, and will also stop moving as soon as they make contact with a person or object when they are in motion. This means that even if your kids tend to tear up and down the stairs, or you have a very young child who is just learning to use the stairs and may try and crawl up them while the stairlift is in use, the stairs are no more dangerous than usual once your stairlift is installed. One thing that you may need to bear in mind when it comes to children and stairlifts, is that the positioning of the tracks the lift runs on on most staircases will prevent you from being able to use a normal baby gate. If you currently use one of these for your child or pets, it may be necessary to plan another solution to stop them getting to the stairs if you are going to install a stairlift. If your household also includes cats or dogs, then you may also have some questions about stairlifts and whether they will pose a safety risk for them. As with children, pets are kept safe by the way stairlifts are designed to be unable to trap or crush things, and will stop if they make contact with something (including your four legged friends) during an ascent or descent of the stairs. Some pet owners report that their dog or cat is a little scared of the stairlift when it is operational (much as they are scared of other appliances like vacuum cleaners), but that tends to be the only real effect they have on animals. Stairlifts are always designed and installed with the safety of everybody who lives with them in mind, so there is really nothing to worry about when it comes to introducing one into your home. The majority of families have no issues whatsoever with their new stairlifts, and very quickly adapt to having them in their homes. This entry was posted in Stairlifts and tagged home, other, People, stairlift. Bookmark the permalink.